NEWS : new album will be recorded during the end of the year. 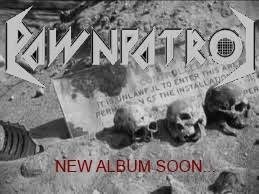 For the moment 5 new tracks are already finished and 2 tracks from the first demo will be re-recorded: "After the Atomic War" and "Post Nuclear Thrash Metal". Le premier album de Dawnpatrol sera enregistré pendant la fin de l'année. Pour le moment 5 nouveaux morceaux sont terminés et 2 morceaux de la première démo seront ré-enregistrés : " After the Atomic War" et "Post Nuclear Thrash Metal".